If you are interested in private yoga in LA or would like more information about retreats, Contact Rosemary or reach her locally by phone at (415) 723-9700. 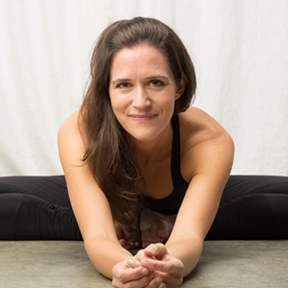 With a loyal student following for over twelve years, Rosemary has held her private yoga students in LA through all that life has to offer – from major life transitions to the devoted exploration of the practice itself – by helping her students foster awareness, growth, and healing through the transformation of yoga. Rosemary teaches private sessions both in studios and in students’ homes, and can work with students to determine how private yoga may be helpful to your life and practice. Rosemary offers private yoga in Los Angeles areas ranging from West Hollywood & the Hollywood Hills, Studio City & Sherman Oaks, Silverlake & Downtown LA – to Westlake Village and Topanga. As many of her private yoga students from Los Angeles to the the Bay Area can attest, Rosemary’s one-on-one teaching offers earnest students of the yoga practice a welcome reprieve from the group class environment, which can often foster an imbalanced focus on the external without equally supporting the individual cultivation of inner fire, body awareness and the mapping of breath to movement. Rosemary’s students schedule private yoga in LA for a variety of reasons, including privacy, scheduling flexibility (eliminating traffic and parking issues), to receive an introduction to yoga in a more intimate space, to more deeply explore an existing yoga practice, and for injury, trauma, and post-surgery rehabilitation in a safer environment. In addition to offering private yoga instruction Rosemary leads Mexico yoga retreats and yoga retreats in California each year. Her popular DeLoach Vineayard Wine & Yoga retreats have been featured in the New York Times Travel Section, and in Food & Wine Magazine, and her annual Women’s Yoga Retreat in Calistoga is going on it’s 8th consecutive year.